The CWR Board of Directors met in Mesa, Arizona from January 15 through January 17. In addition to 14 Board members from across the United States, both international members—Stephanie Manseau (Canada) and Patricia Lenihan (Ireland)—also journeyed to Mesa. The board turned its attention to a wide array of issues on day one of meetings before spending the bulk of the final two days of the sessions distilling CWR’s mission and core values and engaging in intensive strategic planning for the three-year period that will begin in 2020. Rob Cogswell and Jennifer Brandlon prepared and led the opening and closing prayers for each day. At the suggestion of Stephanie Hall and Sr. Joanne Gallagher, C.S.J., time for contemplation and reflection was also integrated into board meeting sessions. CWR Board Chair Kathy Gatliff presented the results of the 2018 Board survey and led a review of the CWR Board handbook. Jane Strittmatter provided an update from the Conference Scholarship Committee. The potential addition of dedicated international scholarships was discussed. CWR staff will conduct follow up inquiries on the subject. Stephanie Manseau and Stephanie Hall delivered an update from the 2019 Conference Committee. Significant progress has been made in the process of filling the conference schedule. The committee has incorporated member feedback into the planning process and will continue to do so going forward. The Conference Committee will coordinate with the 25th Anniversary and Marketing Committees on promotional efforts. Sr. Patricia Lenihan, R.S.C., updated the board on CWR Ireland’s media training plans. The new CWR Ireland logo was approved by the Board. Stephanie Manseau and Jennifer Brandlon provided an Education Committee update and noted that 60 CWR members took part in the recent online video “Flash Conversation” on navigating abuse crisis communication. Plans were also presented for CWR Academy webinars, including webinars for both new CWR members and members who are veterans in the field. 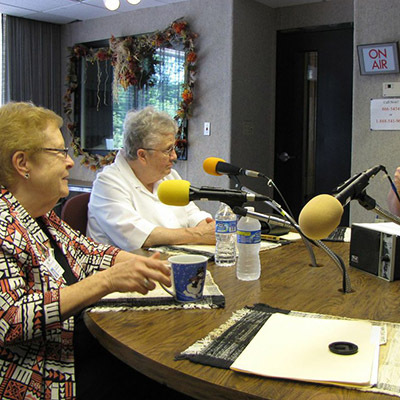 Sr. Maxine Kollasch, I.H.M., provided an update on the 2019 iteration of Cycling with Sisters. Potential steps to broaden the impact of Cycling with Sisters were also discussed. Nick Schafer and Michelle Izguerra provided a tutorial on the administrative area of MemberClicks, CWR’s organization management tool. The minutes from the December 4 board videoconference were reviewed and approved. The board reviewed and voted to accept the CWR Bylaw updates voted on and approved by CWR membership at the October, 2018 business meeting. CWR staff will coordinate with the Secretary on filing Bylaws with the Illinois Secretary of State. The board conducted the annual review of the CWR Policies and Procedures, and voted to accept the Policies and Procedures updates. A potential extension of the term cap for members of the Board was discussed and will be revisited at the May Board Meeting. As part of his Executive Director’s report, Nick Schafer presented potential opportunities for future collaboration with other Catholic organizations, a subject that will be revisited at the May Board Meeting. Nick also outlined the time line for CWR’s Conrad Hilton Foundation grant as well as a provisional 2019 travel schedule and travel opportunities for CWR staff, Board members and members. The subject will be discussed further at the February Board videoconference. At the suggestion of Stephanie Manseau, CWR staff will investigate the potential for further collaboration with Canadian Catholic associations and communicators. Jean Merry presented an update from the Finance Committee. Kathy Gatliff led a discussion on ensuring clear communication channels within CWR. CWR staff will follow up by taking steps to add additional platforms for communication and ensure the vitality of existing resources including newsletters, flash conversations and relationship-building. Kathy Gatliff concluded the first day of meetings by reviewing the Board executive team’s December 7 strategic planning pre-meeting, which laid groundwork for the strategic planning workshop held over the following two days of the January Board meeting. The Board welcomed back author and consultant Michael J. Steinberg on January 16 and January 17. Michael began working with the Board last year in a program entitled “Fostering Dynamic Boards.” At the January meetings, Michael facilitated the Board’s strategic planning workshop. Over a series of full and small group sessions board members collaborated in refining their understanding of CWR’s mission and core values and in analyzing what goals could be suitable for CWR’s next strategic plan. The results of that process and the next planning steps to be taken will be reviewed at the Board’s February video conference. The next board meeting will be held via videoconference on February 26.